Bones caught the eye of the world when a video of her performing tricks to an empty stadium went public. First, she balances herself on two wooden tables before walking slowly over to another area where she precariously walks a “tightrope” made of two steel bars. A wooden table nor metal rods should be able to withstand the weight of such an enormous animal, but Bones is so skinny the trick is much more easy to perform. In fact, if you look in the video, you can see her spine, pelvic bone and shoulders protruding from her skin. It’s a heartbreaking sight. And to think that she probably does this each and every day. When confronted, a park spokesman assured that all of the park’s elephants were “good.” But one look at poor Bones and you know that isn’t the truth. She and the other elephants must be rescued from this park and given a new life in a proper elephant sanctuary. Asking anything less is to allow them to continue to suffer. To have Stanley the Giraffe and the other animals removed from Malibu Wine Safari. Malibu Safari was in the evacuation zone of the areas effected by the Woolsey Fires in California. Malibu Safari is responsible for the lives of close to 100 animals. Including Sanley the Giraffe, a zebra, water buffalo, horses, etc. When advised to evacuate their property, they chose not to evacuate the animals. When rescue groups went out to offer help, they refused the help. When rescue groups went out to check on the animals, most of the property had been destroyed by the fires. Images were taken of the fires still burning right next to the animals. It has been confirmed that there are animals unaccounted for. Animals who most likely parished due to their negligence. It was confirmed on Sunday. November, 11th, that the property was still burning and the animals are still at risk. We are asking that these animals be removed from the property immediately, to a safer location. 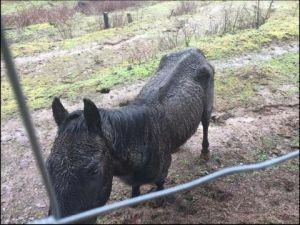 We are also asking that an investigation be put into action as to whether Malibu Safari should be allowed to keep these animals or any animal In their care. They do not have the animals In their best interest. The animals deserve to live in a safe haven where the people responsible for them will ensure their safety at ALL TIMES. My name is Christy Lee, Vice President of Protect Animals Worldwide. As a non profit organization we take great pride in ensuring the safety and welfare of our animal friends and work diligently in partnership with many other organizations across the world. Himeko the elephant was brought to the Himeji Zoo in 1994. She has been imprisoned there since, totally alone: for 24 long, lonely years. During “business hours” at this noisy zoo and amusement park, Himeko faces away from visitors and copes with her stress by bobbing and swaying non stop. She also bangs her tail repeatedly against the steel door of her pen. Each day, Himeko is forced to “perform” for the crowds. Trainers enter her outdoor enclosure and intimidate her with painful, sharp bullhooks. They force Himeko to do tricks, like walk around in a circle and kneel down to have her head brushed with a broom. A passerby noticed the attack and reported this matter to the police. It’s been confirmed by a chief metropolitan officer that, at the time this took place, a security guard who was supposed to be securing the enclosure was not at his post. Another staff member shot and killed the wolf. • Visitors report animals look lethargic, with untreated injuries. They are also weaving back and forth, which is a term called “zoochosis,” a mental illness. There’s a New Prime Minister in Pakistan Imran Khan and he brings a positive message #NayaPakistan ( english translation ; New Pakistan). Laws are needed to be established for animals in captivity and how zoos should be managed with his attention on this pressing matter he can make this happen. Fuko’s repetitive pacing is an abnormal stereotypical behavior that is often seen in captive wild animals kept in substandard enclosures. They are often associated with boredom, anxiety, frustration and depression—and they mean that Fuko’s biological, behavioural and social needs are not being met. But finally Fuko’s plight has come to light! Fuko still has a chance at a better life: experiencing soft soil on her feet, companionship and enrichment to occupy her very intelligent mind. The Elephants in Japan campaign is working with top elephant experts and organizations to help Fuko and other solitary elephants in Japan. BUT we need your help! Please sign and share this petition demanding change for Fuko! Animal advocates are celebrating another victory for captive elephants with news that the Buffalo Zoo in New York is finally closing its exhibit. The zoo announced this week that its two Asian elephants, 36-year-old Jothi and 35-year-old Supara, will be headed to the Audubon Zoo in New Orleans this fall, where they’ll be able to enjoy a far more appropriate climate away from Buffalo’s frigid winters. The news is being welcomed by In Defense of Animals (IDA), which has featured the Buffalo Zoo on its annual list of the 10 Worst Zoos for Elephants five times over the past ten years, and recently requested both elephants’ most recent medical records from the Buffalo Zoo and the City of Buffalo. Not only have these two elephants been forced to endure lives in small, barren enclosures, the winters there leave trapped inside for months where they’re kept on hard surfaces, which are known to cause pain, illness and premature deaths. Video footage taken of them shows them swaying, or exhibiting stereotypic behaviors of elephants that are known to be stressed and unhappy. “We are delighted that Buffalo Zoo will let Jothi and Supara thaw out in a more suitable climate. In Defense of Animals has actively and arduously worked to free these elephants from their decrepit, unsuitable zoo conditions for over a decade. This is a positive move for Jothi and Supara, but we will continue our work to get them to an accredited elephant sanctuary where they can live as elephants instead of as exhibits. One less miserably freezing zoo exhibit for tropical elephants is a cause for great celebration,” said Dr. Toni Frohoff, elephant scientist for IDA. The news also comes just days after IDA called on all zoos to release their elephants to sanctuaries for World Elephant Day over concerns about their welfare. While the industry continues to claim keeping elephants in captivity supports education and conservation, and gives people an opportunity to see them up close, it’s caused immense suffering to both individuals, and to those in the wild by taking more to keep its supply. Captivity may help if elephants were ever going to be returned to the wild, but that isn’t part of the Species Survival Plan for elephants in U.S. zoos, or the goal elsewhere. Now, however, there’s one less zoo keeping them, and once Jothi and Supara head south, the Bronx Zoo will be the last zoo in the state to keep Asian elephants in captivity, which has also made multiple appearances on the 10 Worst Zoos for Elephants list. “Buffalo Zoo has made a positive move for these animals and brought New York a step closer to being free of elephant abuse. Three other Asian elephants are still suffering in New York’s freezing winter climate at the Bronx Zoo, especially Happy the elephant who is kept in tortuous solitary confinement. We call on the Bronx Zoo to have compassion and release the elephants to a sanctuary where they can retire in peace,” said Dr. Marilyn Kroplick, President of IDA. When the Buenos Aires Zoo shut its doors in 2016, the majority of the city’s residents said “good riddance.” The zoo had been widely panned by both the public at large and city officials for being cruel and “degrading” to the animals it held in captivity. The zoo, located in a busy intersection, caused the animals undue stress and housed them in less than par enclosures. So when the mayor announced that he would close the park and turn it into an EcoPark there were signs of hope. The EcoPark would hold fewer animals with better enclosures and care, as well as serve as a refuge for rescued animals. But these grandiose dreams have all but disappeared. The new EcoPark has a dismal record and animal activists now wonder if anything has changed at all. Last month, two of the parks iconic animals succumbed to tragically avoidable deaths. 18-year-old Jackie the giraffe had colic and a perforated ulcer. Ruth, a rare white rhino, died of a plethora of infections. Unfortunately, their deaths aren’t unusual. Since the zoo closed two years ago, more than a hundred have died, and more than 20 have escaped. Animal activists, including the zoo’s former director, thinks animals continue to die because of gross negligence. The promise of an Ecopark where animals can live better and freer seems to be one that Buenos Aires has yet to keep. And if that’s the case the entire enterprise should be shut down and the animals should go to a real sanctuary where they will have the best life possible. Please sign the petition and tell Buenos Aires mayor Horacio Rodríguez Larreta that it’s time to shut down this animal house of horrors. Tell him to close EcoPark. One of the rarer subspecies is the Angolan giraffe which is numbered at around 13,000. Until recently, there were 20 of these endangered giraffes in captivity, now there is one less. Last week, an inconsiderate and irresponsible zoogoer caused the death of a famous Angolan giraffe when they lured the giraffe into a ditch that separates its enclosure from the public. Despite there being a sign asking visitors not to feed the animals right next to the enclosure, the zoogoer offered the animal food and it fell into the ditch where it died. What makes the news even worse, is that the 11-year-old giraffe gave birth late last year, and while her calf is eating on its own, it still was very much dependent on its mother. Police have identified the visitor in question but as of yet, he has not been charged. That is not acceptable. This person should be held accountable for causing the death of one of these rare and beautiful creatures. Please sign the petition and ask the Polícia de Segurança Pública, the Portuguese police force, to charge the culprit and make sure justice is served in the name of the giraffe. Up until recently, Govani the lion lived in a rusty cage just 2×2 meters big as part of a traveling circus. But confinement wasn’t his only source of suffering. Govani’s claws and fangs were removed, and he was so skinny, sick and so stressed that he ended up devouring his own tail. Luckily, Govani has a new lease on life, thanks to the AAP (Animal Advocacy and Protection Association) who rescued him. Now, he can recover slowly in his new home: an open space with trees and swimming spots where he will become a healthy and happy lion again. Unfortunately, in many European countries it’s still perfectly legal for traveling circuses to use wild animals in their shows. More than 1000 are still being exploited throughout the EU. These animals are treated in a cruel and degrading way, confined in small cages and mutilated to make them less dangerous. Step by step, circuses with wild animals are being banned throughout Europe, but there is much still to be done. You can help the activists who are rescuing circus animals with a small gesture by signing this petition asking the European Commission to ban circuses with animals throughout the European Union. In 2015, three chimpanzees were sent to the Bukit Gambang Safari Park (BGSP), a zoo in Malaysia. They were kept separated in bleak and desolate cages for more than two years. The three chimps, Botan (17 y.o. female), Gonbay (29, Male) and Sumomo (19, Female) were kept in abusive conditions. Nothing was done by the wildlife authorities (Perhilitan) to stop their suffering. In December 2017, they were transferred to a new zoo in Malaysia called the Langkawi Nature Park (LNP), which is owned by Sentoria Group Bhd, the same corporation that owns BGSP. Before LNP was opened to the public, Sumomo escaped her night cage and was sadly shot dead by zoo security. Her tragic death came after years of being exploited in a Japanese TV show and abused at the zoos. No action has been taken to punish those responsible for her death. Punish Sentoria Group Bhd according to the wildlife law for keeping three chimps confined to cages for more than two years. Punish Sentoria for the death of Sumomo. Retire the two remaining chimpanzees to a sanctuary in Africa. A total of 3 elephants have died at The San Juan de Aragon Zoo. Maggie, an Asian elephant being the latest. Maggie was euthanized after suffering from degenerative osteoarthritis. Ely could be next on the list of dead elephants at San Juan de Aragon Zoo if nothing is done to help her. It is important to note that every animal at the San Juan de Aragon Zoo is insured and upon the animal’s death the zoo receives compensation. Ely is a former circus elephant who was bought by the Aragon Zoo. The Zoo proclaims they’re treating Ely better than the circus, yet upon her arrival in 2012, her health and well-being has continually deteriorated. Her enclosure is made of concrete floors causing joint pain and pales in comparison to the vast lands she would roam in the wild. Elephants in the wild travel 15 – 30 miles a day, and for Ely to achieve this she would have to walk the back and forth in her enclosure over 300 and times a day. Due to confinement and the unnatural environment, Ely is forced to live in; she exhibits stereotyping a neurological condition conducive to animals held in captivity. Ely suffers from a broad spectrum of health issues, among those issues is a skin condition known as ulcerative dermatitis. The lack of shade in Ely’s enclosure has caused her to become severely sunburnt on top of her already damaged skin. The lack of care and treatment to these injuries has resulted in an infection that is most visible on her back. Last year, a zoo ranger at the Delhi Zoo in New Delhi, India noticed something strange. The number of monitor lizards at the zoo seemed to vary from day to day. The animals were not, of course, playing tricks on him, but his supervisors were. Turns out the lizards were dying at an alarming rate. From the original five, not even one survived but then, just like that, four more took their place. Zoo officials were replacing dead animals with new ones. This story and a host of other horrors come out in a report that found that zoo officials at the Delhi Zoo tried to hide their extremely high animal mortality rate by replacing their dead animals with animals they poached from the wild. An inquiry conducted by authority found that zoo staff illegally captured monitor lizards, sand boa, rat snakes, tortoises and two small Indian civets. Many people think of zoos and their staff as being dedicated to the education of the public on the importance of animals, but the Delhi Zoo staff were more with saving their own skin than saving the animals of our planet. It’s time the Central Zoo Authority shut down this zoo and end their horrific cycle of poach, kill, replace and repeat. Sign the petition and tell officials to shut down the Delhi Zoo. While the law might state that animals are property, most animal lovers strongly disagree. No one would judge you for throwing away an old toy because you didn’t want it anymore, but most people would call their local animal protection agency if you tried to do the same thing to a pet. But that is just what the Calgary Zoo in Alberta, Canada did last month. Kali, a grey wolf, was one of the most beloved animals in the zoo. So much, in fact, that last year the zoo used her in a campaign to promote an online survey to determine Canada’s greatest animal. After more than 10,000 people voted, Kali was declared the winner. But even her beloved status couldn’t save her. Last month, the zoo put her down, simply because they wanted to make room for other, younger wolves. Although Kali was a senior wolf, she was still very much alive and enjoying life. But because the zoo wanted to make more money with younger “cuter” pups, Kali had to go. Zoos should not prioritize young animals just because they bring in more zoo-goers and they definitely shouldn’t put down a perfectly healthy animal. If zoo officials wanted to make room for newer wolves, they should have given Kali to a sanctuary, where she could have lived the rest of her life in relative peace. Please sign this Care2 petition urging Calgary officials to shut down the zoo http://worldanimalnews.com/sign-petition-demanding-closure-calgary-zoo-another-senior-wolf-killed-make-room-younger-ones/! Sunny the elephant has been TOTALLY ALONE in a concrete prison for 29 years. When it’s cold and snowy, she is forced to spend most days locked in her tiny indoor cell at the Nomi Ishikawa Zoo in Japan. With nothing else to do, Sunny tries desperately to cope with her boredom and loneliness—by exploring the walls with her trunk. The heartbreaking evidence: Dark marks all over the walls of her tiny cell—as far as her trunk can reach—from Sunny doing this over and over, alone, bored and trapped, day in and day out … for 29 years and counting. It is cruel and unnatural to make Sunny spend her life in solitary confinement in such a tiny living space. It’s an undeserved punishment for an animal that is naturally highly intelligent and social. Elephants live up to 70 years, and are exceptionally social animals who have families and friends. They grieve their dead. But finally Sunny’s plight has come to light! Sunny still has a chance at a better life: experiencing soft soil on her feet, companionship and enrichment to occupy her very intelligent mind. Elephants in Japan, together with wildlife organization Zoocheck are working to help Sunny and other captive solitary elephants in Japan. BUT we need your help! Please sign and share this petition demanding change for Sunny! Thank you for your help to save Sunny! BENGALURU/ MYSURU: The move to transfer four elephant calves from Mysuru zoo to Singapore zoo has drawn the ire of wildlife organisations and activists. They say any such activity is banned and illegal under the prevailing norms. The elephant calves are presently in Mysuru zoo waiting to be airlifted to Singapore as the Central Zoo Authority (CZA) has not given permission. On January 25, these calves were handed over to the zoo where they have been kept captive for the last 27 days. In 2004-05, then Prime Minister Manmohan Singh had intervened and stopped the transfer of an elephant calf, Veda, from Bannerghatta to an unsuitable zoo in Armenia as a government gift. This action saved many elephants from such a distressing fate. Subsequently, in 2009, a ban was introduced by CZA on gifting elephants to zoos. As per CZA notification, 2009, all elephants are banned from zoo collections throughout the country and all captive ones should be rehabilitated in elephant camps/rehabilitation camps/facilities available with the Forest Department at protected areas. Since the mega-herbivores are free-ranging animals, needing lot of space for their free movement over long distances, such a directive was passed. Nine healthy baby lions have been needlessly killed at a zoo in Sweden. Demand that this zoo change its cruel policy of putting animals down simply to save money or resources. 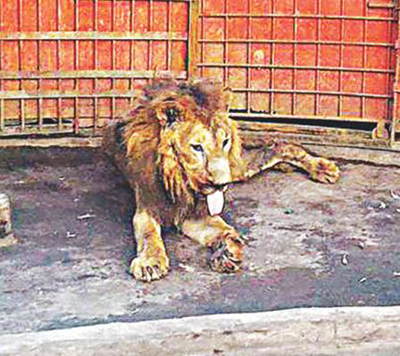 A 17 year-old lion named Juboraj has spent much of his life in a cage with no companions as the Comilla Zoo’s star attraction. However, now that his health is in declined due to his advanced age, zoo officials have decided to move the lion out of public view and appear to be allowing him to languish and starve to death. The poor animals deserves for better treatment and we must demand that he be relocated at once. Concern zoo-goers first noticed the lion’s deteriorating condition in recent weeks, with photographs emerging showing his peotruding spine and hip bones. Bong Su the elephant has tragically been euthanized because of his crippling arthritis, likely caused by years of endless pacing in his cramped zoo environment. This is yet another sign that zoos are no place for these intelligent and sensitive creatures. Sign this petition to call for the end of the inhumane exploitation of elephants in captivity and justice for Bong Su.